Since I started freelancing and travelling I’ve lost a few things and had a few things stolen. A dive computer was stolen from my hotel in Koh Phangan and a bunch of cash stolen from my bungalow in Koh Chang, but luckily I haven’t lost or broken my MacBook yet as it’s not quite replaceable in the same way. It has so many years of memories and hard work stored within. Without my backup process, losing my laptop to theft, malfunction or a mugging would mean my client work, processes, passwords, all gone – the whole thing would be a huge mess. With my simple backup system in place, I could lose all my possessions, go to the Apple store, buy a new MacBook and restore everything online overnight. Cloud storage is just a fancy way to market using the internet to store stuff. Services have been competing over the years and have become ridiculously cheap. The two worth mentioning are Dropbox and Google Drive. It’s going to cost you $9.99 per month or less and you’ll have other benefits like version history and email (if you use Drive). Google Drive comes with all the benefits from Google Apps for Work (which I love). As I mentioned before, I use both Google Drive and Dropbox together, there’s no reason to use both, I just found that some clients only use one or the other and I like different features of each. If you have installed Google Drive, Dropbox, or both. You’ll know they install a folder in your computer’s home directory. Every time you add, change or delete something from this folder, those changes are detected and uploaded to the internet, as well as being synced across other devices. 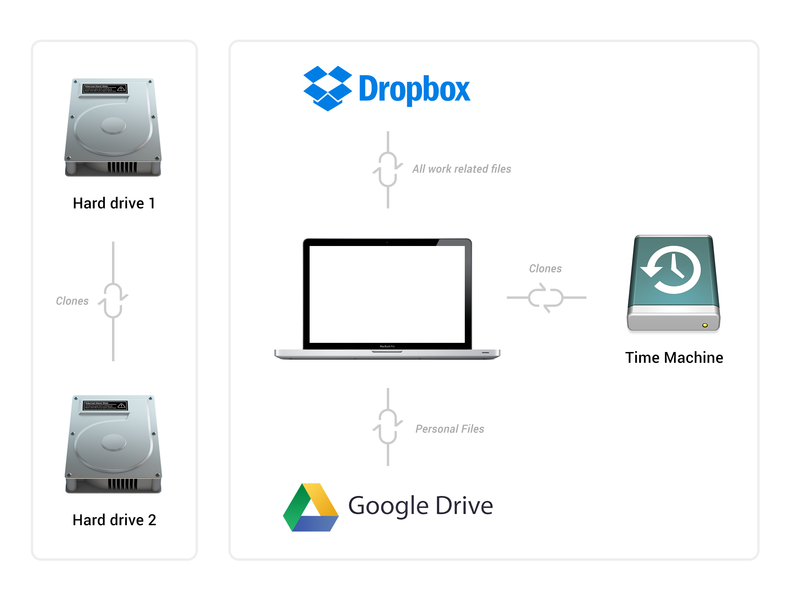 The files are stored on your computer as well, which means you can work offline whilst you’re on a plane or boat but there’s another benefit – the Dropbox and Google Drive folder will also be included in your Time Machine (or Windows equivalent) backup – this is a third layer of redundancy for your work. We don’t want to rely solely on cloud storage. These are physical machines somewhere in the world which may fail too and we don’t always have internet access to upload big files. I have three compact 1TB Toshiba disks, but ideally they’d be bigger. Hard drive 1: Time Machine backup. This is a clone of your laptop. I keep this hard drive separate from my Mac where possible so if one is stolen, the other exists. They’re exact duplicates of each other so this is my first line of defence. Hard drive 2: This is an archive of pictures and videos. This has to exist because after taking so many photos and videos, they can’t all fit on my MacBook anymore. Hard drive 3: This is the backup of hard drive one, exact clones so at least two copies exist – they’re usually kept separate. I always found myself paranoid that if someone stole my physical hard drives, they’d sit and browse through all of my photos and videos – quite violating. After some Googling, I found that you could encrypt your hard drives with a password and it’s super easy. Every time you plug it in, it’ll prompt you for a password before you can access files. See this article for simple instructions on encrypting your drives on a Mac. Windows users can find a similar method here. Email isn’t quite as easy to handle as your files, but they are important. I use Google Apps which provides me with Drive but also a premium email service in which you can use your own domain name. Whatever service you decide to use for your email, you should be using the IMAP protocol. This allows your computer to sync with the email account on your server, whereas POP3 will download it to your computer locally, and then delete it from the server – not good if you want access to that email from any device. The key to making this little system work is not leaving anything important outside of your Dropbox or Google Drive folders. I don’t use any of the other Document or Download folders within my computer anymore, I store all files in either Dropbox or Drive and edit them there in their place. For example if I am developing in MAMP, I have set Dropbox to my local dev environment. If I’m working on Photoshop mockups, I open them directly from my Dropbox folder – after all, they’re normal folders, with super abilities. 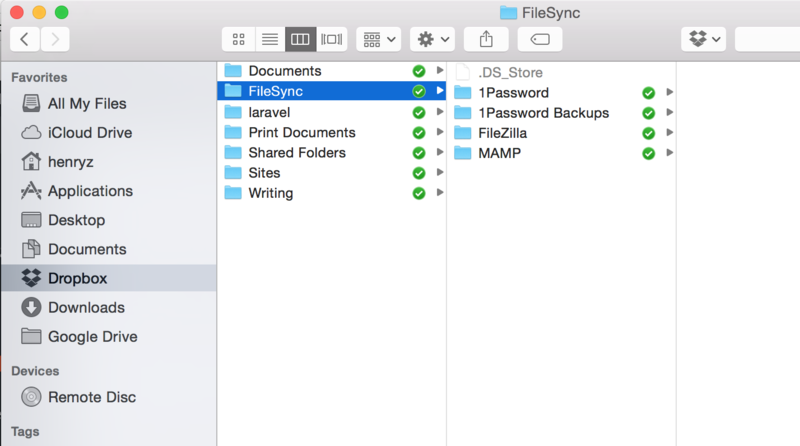 Tip: Applications such as 1Password and Evernote can be synced with Dropbox, so even my passwords are backed up and synced across all my devices. What ways do you backup your files?